Everyone's favorite larger-than-life hero returns in Shrek 2, the #1 comedy of all time hailed by critics and audiences alike as even better than its Oscar®-winning predecessor! USA Today proclaims "there are so many jokes and jests, not even a jelly-bellied ogre could consume them all in one sitting." Happily ever after never seemed so far far away when a trip to meet the in-laws turns into another hilariously twisted adventure for Shrek and Fiona. With the help of his faithful steed Donkey, Shrek takes on a potion-brewing Fairy Godmother, the pompous Prince Charming, and the famed ogre-killer, Puss in Boots, a ferocious feline foe who's really just a pussycat at heart! $108.037 million on 4163 screens. As the summer of 2004 approached, three big sequels appeared on the horizon. Shrek 2 would hit the screens first on May 21st, and then Harry Potter and the Prisoner of Azkaban popped up on June 4th. Finally, Spider-Man 2 came out on June 30th. 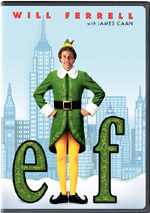 Go backwards chronologically to see the order in which many thought they’d wind up on the box office charts. Most figured Spidey 2 would be the season’s big hit, and Azkaban would wind up in second. Shrek 2 looked like it’d earn the bronze. It didn’t work out that way. Both Spidey and Azkaban did nicely, with $373 million and $249 million, respectively. On the other hand, Shrek 2 raked in an amazing $436 million. That meant it outdid the original by almost $170 million! This places Shrek 2 third on the list of all-time top-grossing movies, just a smidgen about ET and The Phantom Menace. Why did Shrek 2 prove to be such a sensation? Honestly, I don’t know. It’s a reasonably entertaining little flick, but there’s nothing special enough about it to warrant its insane success. Set not long after the conclusion of the first film, Shrek 2 starts with Shrek (voiced by Mike Myers) and Fiona (Cameron Diaz) on their honeymoon. This news comes as a surprise to Prince Charming (Rupert Everett), who just arrived at the castle in which Fiona was imprisoned in the first flick. He planned to rescue her and make her his bride, but she’s long gone. They return home to find Donkey (Eddie Murphy) in their lair, and he hopes to stay. Apparently Donkey ran into some problems with his romantic partner Dragon and wants to hang out with them. They soon get distracted from this issue when Fiona’s royal parents summon the happy couple back to Far Far Away for a celebration of their union. This causes discord since her parents - King Harold (John Cleese) and Queen Lillian (Julie Andrews) - clearly expect a human Fiona and husband, not ogres. Shrek understands the pitfalls and refuses to go. Unfortunately for him, Fiona wins the argument, so the couple and Donkey head out on the journey to Far Far Away. The whole kingdom turns out for their arrival, which doesn’t go too well when everyone sees the big green beasties. The King seems particularly dismayed, which means that he and Shrek hit it off badly and bicker. A distraught Fiona’s tears are greeted by a visit from her Fairy Godmother (Jennifer Saunders). She promises a makeover to ensure that Fiona will land a man, so she gets a shock when she meets Shrek. After the Godmother splits, the married couple bickers more since Fiona thinks Shrek didn’t try very hard to win over her dad. Matters complicate when we see a similar argument between Fiona’s parents. In the midst of that fight, the Godmother visits Harold, and we learn that she’s Charming’s mother. It turns out that Harold made a deal with her years earlier. The Godmother performed an as-yet-unspecified favor for the King, and in return, he promised Fiona to Charming. Harold now needs to find a way to get rid of Shrek or risk the Godmother’s wrath. He heads to a seedy bar to hire a mysterious assassin to off our favorite Ogre. Back at the castle, Shrek thinks he’ll get a second chance to bond with Harold when the King invites him on a morning hunt. Harold tells Shrek to meet him at the Old Oak, where he ultimately finds the assassin - Puss In Boots (Antonio Banderas) - waiting for him. Shrek and Donkey easily keep the cat from achieving his mission, and they find out who set Puss after him. Since Shrek feels he can’t make Fiona happy, he decides to contact the Fairy Godmother. Of course, she acts on her own agenda, so while she pretends to help Shrek, she actually tries to undermine him. 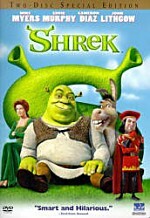 The rest of the movie follows Shrek’s attempts to keep Fiona and avoid all the complications placed in front of him. As I thought about how to express my opinion of Shrek 2, I was darned tempted to simply cut and paste my comments about the first flick. I wouldn’t call the sequel a remake, as it differs enough from the original to allow it to stand on its own. However, the pair share so many similarities that it becomes tough to find strengths or weaknesses shared by one and not the other. To be sure, the two flicks employ rather similar stories. The sequel gussies up its plot with a lot of new shenanigans, but when we look at the basic tales, they match closely. Shrek loves Fiona and tries to prove this to her. Someone else wants her and Shrek needs to battle for her. I can’t say the retread portions really bother me, though, as they come wrapped in such dissimilar clothes that they work independently. Nonetheless, I’d have preferred a more original take on things. The world of fairy tales offers a myriad of possibilities, so why tell the same story twice? Happily, Shrek 2 tosses out enough clever bits to make it enjoyable. This is really the sort of movie that needs to be watched a few times to pick up all the references and gags. Pop culture references abound, and while these will clearly make the film age poorly, they add some spark to the proceedings. I think the gags are awfully inconsistent, though. Some are clever and inspired, while others seem easy and without any challenge to them. Shrek 2 employs the “throw everything at the wall and see what sticks” method of comedy. This means that while it provokes more than a few chuckles, it doesn’t enjoy a great gags to laughs ratio. One of the movie’s most fun elements comes from the rivalry between Puss and Donkey. Banderas proves a surprise as the killer kitty, as he brings real flair to the part. He and Murphy bounce off each other nicely and help create a lot of entertaining moments. I didn’t think a lot of Donkey in the first flick, but he works much better with his feline foe. Unfortunately, Shrek remains a boring character. He’s not grumpy and unpleasant enough to develop a personality, but he’s also not endearing or entertaining. Fiona lacks the spark she displayed in the original movie. There she was feisty and independent, but here she just comes across as bland. As for the new supporting characters, other than Puss, only one stands out: Mongo the giant gingerbread man. Yeah, he seems unabashedly inspired by the Sta-Puft Marshmallow Man in Ghostbusters, but he adds a delightful twist to the movies third act, and his fate becomes surprisingly touching. Otherwise, I can’t say much for the new personalities. Godmother and Charming are competent villains and that’s about it. Harold and Lillian don’t receive enough development to make them interesting either. When I looked back at my review for the first movie, I was surprised to see my praise for the animation. I called it “an attractive movie that shows nicely executed animation at all times.” The former statement remains true to a degree. Much of Shrek 2 does look good, as it delivers elaborate and lush environments along with many appealing non-human characters. However, the humans demonstrate a creepy design. What’s the deal - are they supposed to be cartoony or photo-real? They come across as neither, which makes them look plastic much of the time. (All except Joan Rivers - her cartoon doppelganger looks more human than the real plastic surgery obsessed hag.) The characters don’t move naturally either. There’s something weird and awkward about the animation. Look at the way objects swing and dangle; they flop in a forced manner that makes them unconvincing. My ultimate impression of Shrek 2 closely matched what I thought of the original movie. I enjoyed it but never thought it took off and became something special. For both, I felt they had their moments and proved generally entertaining. However, they failed to deliver a certain intangible that would take them to another level. Shrek 2 is fun but not a classic. Footnote: be sure to sit through the end credits for a Donkey-related epilogue. 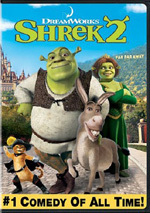 Shrek 2 appears in an aspect ratio of approximately 1.85:1 on this single-sided, double-layered DVD; the image has been enhanced for 16X9 televisions. I expected fine visuals from Shrek 2 and got them in this excellent transfer. Across the board, sharpness looked terrific. No signs of softness materialized at any point during the movie. Instead, the flick appeared distinctive and well-defined. No problems with shimmering or jagged edges popped up, and I noticed no signs of edge enhancement. The movie lacked any source flaws. Shrek 2 offered a lively palette that befit a fairytale story. The film displayed a wide variety of hues and always imbued them with great life and vivacity. Never did I discern any flaws in the colors, as they were consistently dynamic. Blacks were deep and firm, while low-light shots displayed solid definition and clarity. The image lacked a certain sparkle that would have made it among the all-time best, but it remained good enough for an “A”. On the other hand, the Dolby Digital 5.1 soundtrack of Shrek 2 was less stellar. Some of this stemmed from the generally lackluster soundfield. The movie didn’t make great use of the surrounds and mainly focused on the front spectrum. In that domain, music showed good imaging and I also heard pretty positive localization and melding of environment effects. The surrounds added general reinforcement for the most part. They kicked into moderately higher gear with a few scenes, especially during the climax. However, they didn’t act as strong partners in the mix. Not that this was a particularly ambitious track in general, as it usually stayed with a lot of music and only mild effects. Ironically, music presented the weakest aspects of the mix in regard to quality. The score sounded reasonably dynamic, but the many pop tunes came across with less flair. They tended to lack low-end material, which made them sound thin. Effects demonstrated the best bass, as a few louder scenes offered good rumble and boom. Those elements also sounded clean and distinctive. Speech was good, with consistently natural and intelligible tones. I almost gave the audio a “B-“ because of its general lack of scope and the moderately weak music, but the climax packed just enough punch to earn the mix a “B”. When we head to the DVD’s supplements, we find two audio commentaries. The first comes from directors Kelly Asbury and Conrad Vernon, both of whom sit together for their running, screen-specific discussion. A chatty affair, the pair cover a mix of subjects, though most of them relate to story elements. We get a little information about visuals and animation, but mainly we hear about character issues, working out the plot and other areas, and keeping things on the right foot. The pair joke with each other - their frequent use of incorrect words becomes a running gag - and make this an informative and likable piece. Next we get a commentary with producer Aron Warner and editor Mike Andrews. They also sit together for their running, screen-specific discussion. As with the directors’ track, this one focuses on storytelling, but in a different way. Here the chat concentrates on pacing, editing, and melding the different elements. Whereas the first commentary went over how they came up with the various story pieces, this one lets us know how they combined the parts into the coherent final. We learn about cut sequences as well as some music and a few technical issues. As with the prior commentary, this one displays a wry humor that allows it to remain consistently engaging. I like both commentaries, especially since they nicely complement each other. Found on the main menu, Far Far Away Idol is a new piece of animation created for the DVD. We see various characters sing appropriate pop tunes for a judging panel of Shrek, Fiona, and Simon Cowell. It’s cute and enjoyable. You get to vote on your favorite, but it makes no difference, as the winner always remains the same. However, you can go online and cast a ballot there. A featurette called The Tech of Shrek 2 fills six minutes, 32 seconds. It includes movie clips, behind the scenes elements, and interviews. We hear from Asbury, Warner, Vernon, writer/director Andrew Adamson, visual effects supervisor Ken Bielenberg, producer David Lipman, DreamWorks chief technology officer Ed Leonard, production designer Guillaume Aretos, character designer Tom Hester, co-supervising character technical director Lawrence D. Cutler, costume designer Isis Mussenden, art director Steve Pilcher, actor Mike Myers, and executive producer Jeffrey Katzenberg. 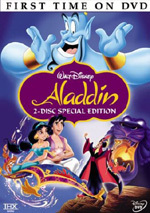 They tell us a little about the movie’s various visual elements, and those include computer graphics challenges, costumes and production design. Unfortunately, the program emphasizes how “amazing” all the work is, so it provides very little real information. In Meet the Cast, we get a 10-minute and four-second featurette. We discover notes from Adamson, Asbury, Vernon, and actors Myers, Cameron Diaz, Eddie Murphy, Jennifer Saunders, Julie Andrews, Antonio Banderas, Rupert Everett and John Cleese. They talk about their roles and the story. It’s fun to see the occasional shots of the actors at work, but otherwise, this remains a very promotional piece. Again, we hear how great everything is and we see an overabundance of movie clips. More recording footage and less hyperbole would make this a better piece. With Meet Puss in Boots, we get a four-minute and three-second featurette. It presents notes from Myers, Diaz, Banderas, Murphy and Adamson. Banderas tosses out a couple of decent character insights, but mostly we see more movie snippets and hear a lot of praise for various participants. Yeah, it’s another fluffy piece. Next comes The Music of Shrek 2, a four-minute and 55-second featurette. In it, we find remarks from Adamson, Banderas, music supervisor Chris Douridas, singer/songwriters Adam Duritz, E and David Bowie, singer Pete Yorn, and composer Harry Gregson-Williams. They chat about the movie’s songs, and we get a few notes about their origins. This program is a little more informative than its predecessors, but not much. In the Technical Goofs section, we find a bunch of animation errors. These aren’t fake bloopers ala the Pixar DVDs; instead, they provide true rendering mistakes. There’s some creepy stuff in this three-minute and 21-second clip, but it’s mostly a fun look at the problems encountered by the animators. When we go to the Far Far Away Times, we get 21 screens of material. These illustrations show the fake newspaper elements that mention the main characters. It’s a cute feature. More stillframe information pops up in the Cast and Filmmakers domains. Within the former we get entries for actors Mike Myers, Eddie Murphy, Cameron Diaz, Antonio Banderas, Julie Andrews, John Cleese, Rupert Everett, and Jennifer Saunders. The latter displays listings for director/writer Andrew Adamson, directors Asbury and Vernon, producer Warner, editor Andrews, producers David Lipman and John H. Williams, executive producers Jeffrey Katzenberg, writers J. David Stem, Joe Stillman and David N. Weiss, composer Harry Gregson-Williams, music supervisor Chris Douridas, editor Sim Evan-Jones, production designer Guillaume Aretos, visual effects supervisor Ken Bielenberg, co-visual effects supervisor Philippe Gluckman, art director Steve Pilcher, supervising animators Raman Hui, Tim Cheung, and James Baxter and costume designer Isis Mussenden. These offer above-average looks at the participants; they remain in the “annotated filmography” realm to a degree, but they provide more details than usual. Additional text appears in the Production Notes. It looks at developing the sequel, the cast, and creating the animation. Despite a moderately puffy tone at times, the notes give us a pretty good look at various elements, with some particularly nice details about the animation challenges. The DVD opens with some ads. We find promos for Shark Tale and Madagascar. The trailer for the latter also appears in the New from DreamWorks Animation section. Previews includes ads for Lemony Snicket’s A Series of Unfortunate Events, Two Brothers, Thunderbirds and Millennium Actress. In regard to the pieces that start the disc, annoyingly, unlike on most DVDs, you can’t zip these in a simple way; you can fast-forward through them but not use the chapter skip or menu buttons. Under the “DreamWorks Kids” banner, a mix of other extras appear. “Shrek’s Music Room” contains three elements. Fiona’s Jukebox just acts as an alternate chapter search; choose a song from the movie and it’ll let you jump right to that tune. Sing-Along with Fairy Godmother shows that character’s song along with lyrics displayed on the bottom of the screen. Can’t we already do that via the various subtitle options? Finally, we see a music video for Counting Crows’ “Accidentally in Love”. It’s nothing more than the usual shots of the band performing mixed with movie clips. Blegh! Favorite Scenes is essentially another alternate version of “Scene Selection”. It provides different clips under such subsections as “Laugh Out Loud” and “Gross Out”. It seems useless to me, but I guess it doesn’t hurt. ”Gingy’s House of Games” presents three components. Interactive Map of Far Far Away lets you select various locations. Pick them and then watch the relevant snippets from the movie. Find Puss In Boots offers a fairly pointless guessing game. Lastly, Save Fiona! presents a trivia challenge. It’s easy if you’ve seen the movie, and it’s forgiving if you miss any items. Your “reward” is nothing more than a clip from the flick, unfortunately. If you liked Shrek, you’ll probably enjoy Shrek 2. Actually, the sequel’s probably a little better than the original, but both are similar overall. Though Shrek 2 offers some fun, it doesn’t ever really take flight. The DVD presents excellent visuals plus pretty good audio. Most of the extras are fluffy and useless, but the two audio commentaries include a lot of solid information. While I can’t say I’m enthusiastic about the movie, it comes across as likable enough to merit a moderate recommendation.